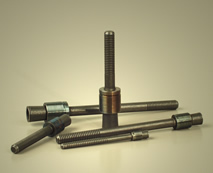 SK Series Plugs - Bolt Products Inc.
Pull/Expand principle. The installation tool maintains sleeve position in the hole while pulling the mandrel into and expanding the sleeve until the mandrel breaks off at a predetermined point. Anchorage is achieved by the serrations on the outside of the sleeve anchoring into the base material, especially in soft material.